Home > Cruise News > Fred Olsen Cruise Lines > Fred. Olsen River Cruise – Pre-register now! We are excited to share the news that Fred. 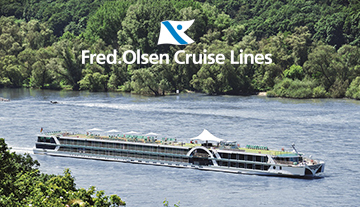 Olsen Cruise Lines has announced a dedicated cruise programme by river boat for 2018! Fred. Olsen offer traditional British cruises with a comfortable and friendly onboard atmosphere, on a fleet of four fantastic ocean cruise ships. So we were pleased to hear that a similarly welcoming and relaxing ambience is expected onboard Brabant, the stylish river ship sailing for Fred. Olsen in 2018. At 110 metres long and with 4 decks (Haydn, Strauss, Mozart and Sun), Brabant can accommodate up to 156 guests with a comfortable range of rooms and suites. Many rooms feature Juliette balconies with panoramic windows for optimal views. Life onboard is intimate and relaxed, with an easy-on-the-eye interior design of warm cherry woods and contemporary colours. Brabant will sail a total of 30 scenic and spellbinding river cruises departing in 2018 with durations ranging from 5-25 nights. Cruises have been specifically designed to soak up daylight hours and make the most of some truly spectacular scenery. The destination filled experience is further enhanced by Fred. Olsen’s hand-picked selection of Shore Tours, creating a memorable river cruising experience both onboard and onshore. Cruises are on sale now and are expected to be popular. Take a look a Fred. Olsen's new river itineraries now! Fred. Olsen’s Enjoyment Promise is applicable to the river cruise collection, ask for more information.